Coach Mendo has coached and trained over 40,000 kids and adults and counting. He runs both a non-profit organization serving underprivileged youth and a for profit business working with aspiring athletes. Coach Mendo has refined his coaching skills over 25 years and is highlighted in his book Maximizing Your Results, The Relentless Pursuit of Excellence in Business, Athletics and Life. 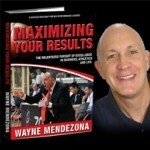 Find out more about Coach Mendo at http://www.maximizingyourresults.com.